Intro: The students were able to find the words on the second page of the worksheets but weren’t able to do the matching. So it was back to the drawing board for another way of teaching it so it sticks. This specific reading of the text led to some very interesting questions that showed a deep comprehension. Why does it not mention ה’ by name until the second half? Why do we need to say these praises each day? What is the difference between אמר והיה העולם and עושה בראשית? 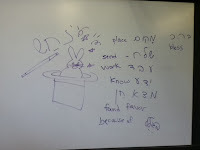 One student even noted that the first half talks about ideas similar to Yigdal and suggested that maybe after a long day involved in secular things we need to remind ourselves of Who ה’ is and what we believe before we can praise Hashem. Chumash: The room is all set up beautifully for learning Chumash. 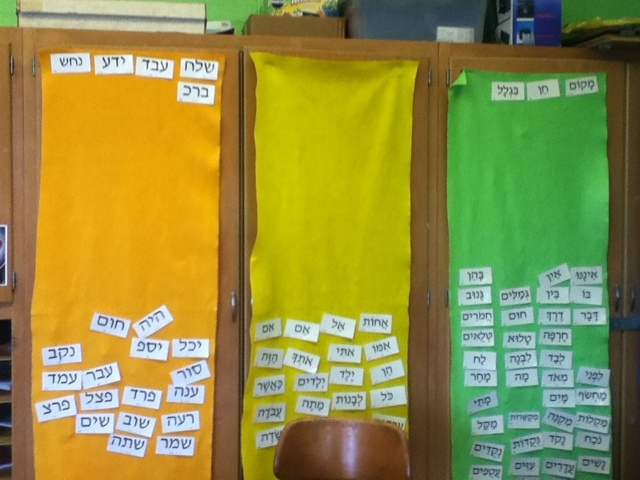 The shorashim, easy and hard words are up, the sheets from last unit have been emptied into their portfolios. 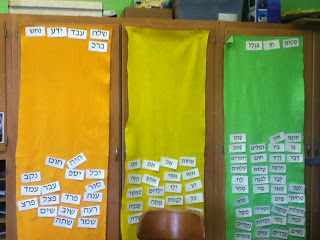 Some words on the felt were not in albhabetical order, so my advanced students volunteered to work alphabetizing them. This was helpful because they don’t need to give their full attention to the other work and alphabetizing is a useful skill for looking up things in a glossary. The new pesukim linear translations are in and ready to be learned. 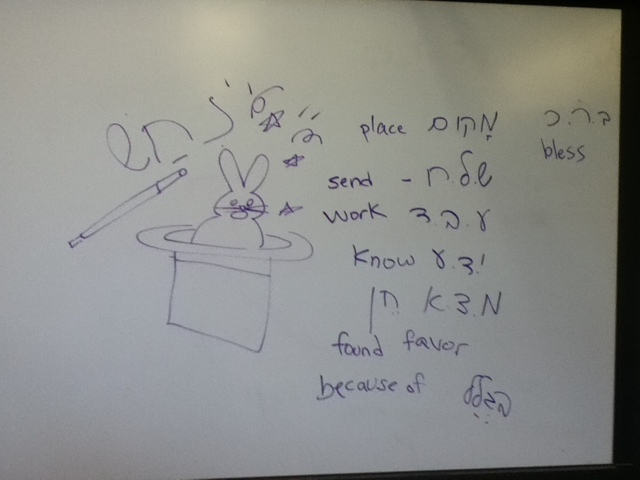 1) start off with doing the skill work on the board עבדתיך’ עבודתי שלחני ואתנה. 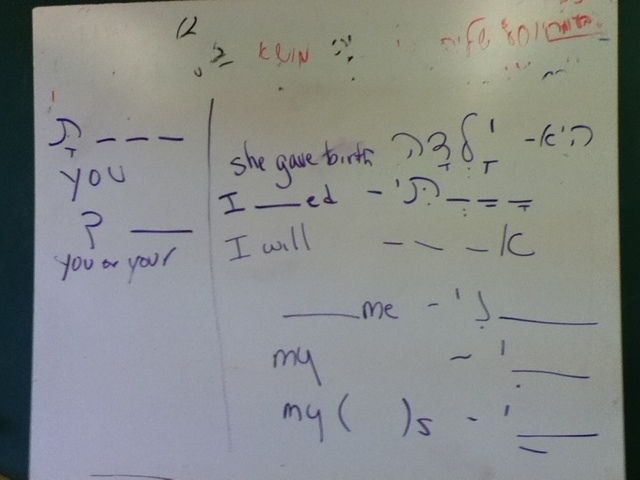 I have two white boards so the shorashim went on the left board, the grammar rules went on the right. 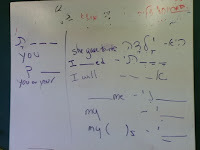 The class figured out from the the grammar rules on the board that the pesukim would be a conversation. I like to draw the new shorashim which keeps it more entertaining and teaches the vocabulary more naturally. Ivrit: Using a book is much less fun than the free style journaling. Today, the book has a comic of a girl inviting her friend to a party. I don’t want to repeat the boredom (for me and I assuming the kids) of reading as a group. We will have groups of 2 read the conversation to each other. Then they will pretend to invite a friend to a party. Guided practice: Write a sentence inviting a friend to your house. Give the address and time. End the conversation politely: אני מזמינה אותך לביתי – רחוב אלמ מספר 33 בשעה 10. להתראות! Write a conversation between 2 people, 1 inviting the other. Skill: Understanding conversation, working as a group, holding a conversation.